TripAdvisor has come out with its list of the top 15 “destinations on the rise” for 2012. Six of these destinations are where RedWeek members have timeshares listed for rent, exchange, or resale. We’ll look at these great vacation spots in a 3-Part series. 1. Nashville, TN. Country music is the lifeblood of Nashville, where musical attractions include the Grand Old Opry and the Country Music Hall of Fame. The Grand Ole Opry is not just Nashville’s number one attraction, but is an American icon. This is where unforgettable moments happen every week with country music’s new stars, superstars, and legends. Here you’ll be able to see live performances, theater, and there’s even a Piano Bar. The Country Music Hall of Fame a great place for everyone. Non-country western fans will find it interesting, and real fans will find it amazing. It is operated by the non-profit Country Music Foundation. 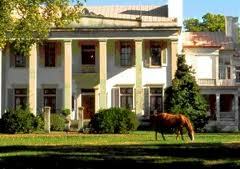 Belle Meade Plantation (see top photo) is a 30-acre historic site just six miles from Nashville. Begun in 1853 as a premier horse-breeding operation, the plantation survived the Civil War with its remarkable Greek Revival mansion intact. On your visit you’ll be able to tour the mansion, and activities are available for older children. Check the timeshare rentals, exchanges and resales available in Nashville. 2. Fort Myers, FL. Nicknamed “The City of the Palms,” this remarkable vacation destination in southwest Florida is located between the banks of the Caloosahatchee River and the shores of the Gulf of Mexico. The Edison and Ford Winter Estates are 20 acres of historical buildings and gardens, along with the Edison Botanic Research Lab. Tours can be taken through the Edison Main House, the Guest House, and the Caretaker’s Cottage, and the Ford House. The Estates Museum houses numerous inventions, artifacts, and special exhibits. Authentic 1929 landscaping is maintained throughout the property, including the award-winning Moonlight Garden. 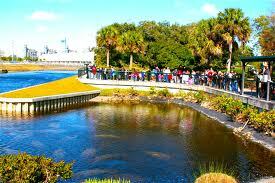 Manatee Park (see photo) is a 17-acre park that allows for viewing of manatees from November through March. This is when the temperatures of the Gulf of Mexico and the rivers drop below 68F degrees, and the endangered manatees seek refuge from the cold waters by swimming into the Florida Power and Light’s warm-water discharge canal. This area creates a non-captive sanctuary that provides a winter haven for the warm-blooded manatees. Butterfly Estates in downtown Fort Myers is an Eco-Attraction where you can surround yourself with thousands of butterflies. The 3,600 sq. foot Glazed Glass Butterfly Conservatory is where you’ll delight in watching the butterflies dart amidst cascading waterfalls and lush tropical nectar plants. Check the timeshare rentals, exchanges and resales available in Fort Myers.